Some of the premiere fishing areas in the Florida Keys are on the famous Islamorada flats. Bonefish, tarpon, redfish, snook, permit are the catch-of-the-day here, but expect barracuda, shark and other species to visit too. This is great fishing on light tackle, but you'll need a guide to find the hot-spots and navigate these treacherously shallow waters. Navigating the channels and flats on the shallow bay side of the Keys requires considerable local knowledge. 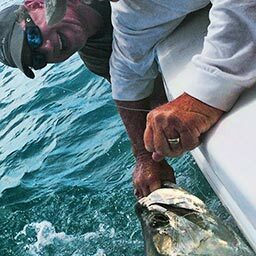 World class adventures are found in the blue-waters of the Gulf Stream, just offshore from the Florida Keys. Dolphin, sailfish, wahoo, tuna, king mackerel, and marlin inhabit these 200 to 2,000 foot deep waters of the Atlantic Ocean. Sailfish and dolphin are the popular targets here. 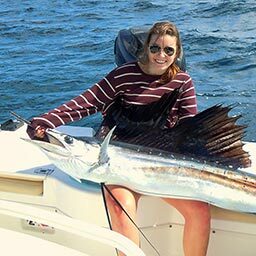 Both species are caught year-round; the best sailfish action is from November through January and the best dolphin fishing is during the summer months.